>>Carrie Underwood will perform the national anthem to officially open Country Radio Seminar 2011 on Wednesday, March 2. This marks the first time she has performed the national anthem at CRS, which runs March 2-4 at the Nashville Convention Center. “Wow. What else can I say?” says CRB President Mike Culotta. “What a way to kick off Country Radio Seminar 2011! We are very appreciative and very excited to welcome one of the biggest superstars in Country music to our event. Carrie is certainly going to get us started in style! >>Luke Bryan and CMT are hosting the “Luke Bryan Spring Break Sweepstakes” to support his 3rd Annual Spring Break shows at Spinnaker’s in Panama City March 8 and 9. One lucky winner will receive hotel accommodations for seven days and nights (3/5-12) in Panama City. The contest runs through February 23 and details are here. Bryan’s EP Spring Break 3…It’s A Shore Thing will hit iTunes on March 1 and features four previously unreleased songs. 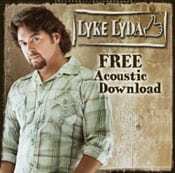 >>Davis Music Group artist Jacob Lyda is offering an free download of an exclusive acoustic track for fans who visit his Facebook page and “Lyke Lyda.” Visitors to the page will also be able to hear Lyda’s single “I’m Doing Alright,” currently at No. 73 on MusicRow’s CountryBreakout Chart, as well as selected other tracks.